To Cite: Rahimi Bashar F, Doosti Z, Chouhdari A, Shokouhi S, Torabian S, et al. Bacteriologic Evaluation of Ventilator-Associated Pneumonia According to Stress Related Mucosal Disease Prophylaxis in the Intensive Care Unit, Arch Clin Infect Dis. 2018 ; 13(6):e82521. doi: 10.5812/archcid.82521. Background: Ventilator associated pneumonia is one of the most important nosocomial infections with often poor outcomes and heavy economic burdens on health care systems. Objectives: Several studies have been done for evaluating the effect of different types of stress related mucosal disease (SRMD) prophylaxis on nosocomial pneumonia, as among factors participating in its establishment, gastrointestinal tract is believed to play an important role especially in ventilator-associated pneumonia. Methods: In this cross-sectional study, 150 patients who were admitted to intensive care unit (ICU) and developed documented culture positive VAP, were evaluated for the study inclusion criteria. The patients with clinical pulmonary infection score (CPIS) ≥ 6 were included and some others with conditions affecting comparability excluded. The patients with Acute Physiology and chronic health evaluation II (APACHEII) scores between 10 and 24, within the first 24 hours of ICU stay, were included. Finally, 100 patients who fulfilled all criteria were evaluated for the responsible organisms and type of SRMD prophylaxis they had received. The patients included were either on intravenous pantoprazole (49 patients) or intravenous ranitidine (51 patients). The goal of this study was to evaluate the organisms, which have been isolated from the sputum of ICU patients with ventilator-associated pneumonia, according to their SRMD prophylaxis regimen. Results: There were 59 men (59%) and 41 women (41%) ranging from 19 to 82 years old. The mean ages were not significantly different between the two groups (P = 0.586). APACHEII score was ranging between 15 and 21 with the mean of 17.57 in pantoprazole and 16.80 in ranitidine group (P = 0.006), there was a statistical but not clinical difference. With P-value of 0.001, there was significant difference in ICU stay days. The mean mortality rates were 18.4% and 1.8% for pantoprazole and ranitidine group, respectively. The difference was statistically significant (P < 0.001). Multi-drug resistant pathogens were significantly higher in the pantoprazole group (0.001). The organisms, which have been obtained from each group were different. Acinetobacter and Pseudomonas aeruginosa were highly cultivated in the pantoprazole group, while Staphylococcus aureus and Proteus were more in patients who had received ranitidine. Conclusions: It can be suggested that each bacterium has a unique propensity to grow in specific gastric pH and other systemic changes made by various agents used for SRMD prophylaxis. More studies are needed to evaluate large number of patients receiving SRMD prophylaxis, with perspective of VAP incidence, the responsible organisms, hospital and ICU stay days, and mortality rate in order to prevent poor outcomes caused by specific organisms. Ventilator associated pneumonia (VAP) is one of the most important nosocomial infections with often a poor outcome and heavy economic burden on health care systems due to increased mechanical ventilation and intensive care unit (ICU) stay days as well as mortality rates (1-3). According to previous studies, it is estimated that 3.5% of patients hospitalized for three or more days developed pneumonia (4) and prolonged ventilator dependency results in increased VAP incidence and consequent mortality (5, 6). Its cardinal signs include fever, incidence of or increase in purulent secretions, leukocytosis, oxygenation worsening, new or progressive lung infiltrates on chest imaging, and cultures of secretions revealing pathogenic organisms (7, 8). Most common pathogens are Staphylococcus aureus, Pseudomonas aeruginosa, Klebsiella spp., and Acinetobacter spp. drug resistance is common. A total of 50% of Staphylococcus aureus isolates are methicillin-resistant, 25% to 30% of Pseudomonas and Klebsiella isolates are ceftazidime and cefepime resistant, and 60% of Acinetobacter isolates are carbapenem resistant (9, 10). There are some factors that make the patient vulnerable to develop nosocomial and ventilator-associated pneumonia. One of these important factors is the increase in the bacterial burden of the upper respiratory and orogastric tracts due to prolonged hospitalization, antibiotic exposure, and gastric acid suppression (4, 11-15). There are several studies that have been conducted among critically ill and mechanically ventilated patients for evaluating the effect of different gastrointestinal prophylactic agents, other than pantoprazole, on bleeding prevention, and nosocomial pneumonia occurrence (16-22). Pantoprazole is a proton pump inhibitor (PPI) that is widely used in critically ill patients due to potent gastric acidity lessening and therefore, lowers gastrointestinal bleeding rate. For this reason, evaluating the incidence of gastrointestinal bleeding and ventilator-associated pneumonia in critically ill patients receiving pantoprazole and other agents of stress related mucosal disease (SRMD) prophylaxis, especially ranitidine (a histamine-2 blocker), has been of importance and value (23-26). 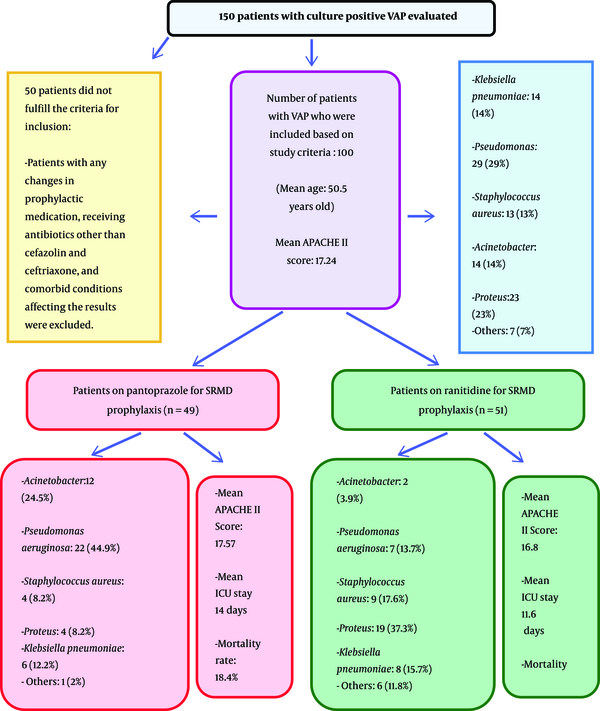 Some of the studies in this domain have been done by the authors of this article, for example evaluating the effect of ranitidine and pantoprazole on gastrointestinal bleeding prophylaxis in critically ill patients (23), investigating the predicted mortality of critically ill patients in the pantoprazole and ranitidine recipients (24), or comparing the effect of pantoprazole and ranitidine on VAP incidence (25). This study is along with the preceding ones and complementary of them, as we know, there is no study that has been done for evaluating the organisms responsible for VAP in critically ill patients admitted in the ICU, according to their SRMD prophylaxis regimen. In this study we aimed to compare the patients who had developed VAP during mechanical ventilation, in the organisms obtained from their secretions, based on SRMD prophylaxis they had received, either pantoprazole or ranitidine. In this cross-sectional study that has been done in the ICU of Besat Hospital, Hamadan University of Medical Sciences, Hamadan, Iran, from May 2012 to May 2014, a total of 150 ICU patients who had been on a mechanical ventilation (either due to the need of respiratory support after surgery or trauma) and developed documented culture positive VAP were included. In this study, VAP was defined as an emergence of fever, purulent secretions (or increase in the amount of purulent secretions), leukocytosis, worsening in oxygenation, new or progressive lung infiltrates on chest radiograph or CT scan, and cultures of secretions revealing pathogenic organisms, with at least 48 hours of intubation. With this regard, previously healthy patients older than 18 years old, with a history of multiple trauma or surgery in whom intubation was necessary, and with a clinical pulmonary infection score (CPIS) equal and more than six, according to CPI scoring of Schurink et al., were included (27). APACHE II score, (which is one of the severity-of-disease classification systems for patients in ICU) and predicted mortality were calculated within the first 24 hours of ICU stay, and the patients with APACHE II score between 10 and 24 were included. A total of 100 patients who had been included and then divided into two groups based on SMRD prophylaxis were on either PPI or H2 blocker, on 40 mg of intravenous pantoprazole (NycomedExir Pharmaceutical Co., Broojerd, Iran) administered daily, or 50 milligrams of intravenous ranitidine (Kimi) administered three times daily for SRMD prophylaxis. The patients with any changes in SRMD prophylaxis during ICU stay were excluded. All secretion samples were obtained by mini-bronchoalveolar lavage (mini-BAL) and cultured in blood agar media; hose with contaminated samples were omitted. The patients with neutropenia, AIDS (acquired immunodeficiency syndrome), corticosteroid receipt, and any other conditions that predispose developing special nosocomial infections were excluded from the study. Patients receiving antibiotics other than those for surgical site infection prophylaxes (cefazolin and ceftriaxone) were excluded from the study. Finally, 100 patients who fulfilled all the criteria mentioned above were evaluated for the responsible organisms and type of SRMD prophylaxis they were on in order to conclude whether the type of SRMD prophylaxis promotes the growth of some organisms resulting in VAP or not. With respect to the type of prophylaxis received, the patients were categorized into two groups and compared. The flow of patients has been demonstrated in Figure 1. Data analysis was done by using Student t test for normally distributed variables and Mann-Whitney U test for variables that were not normally distributed. The Chi2 and Fisher Exact tests were used to compare categorical variables as appropriate. Among these 100 VAP patients, 49 patients were on pantoprazole (49%) and 51 on ranitidine prophylaxiacinetobacs (51%) (Table 1). There were 59 men (59%) and 41 women (41%) ranging from 19 to 82 years old with the mean of 50.5 years (total); the mean age was 49 and 51 years old in pantoprazole and ranitidine group respectively, which were not significantly different (P = 0.586). APACHEII score was ranging between 15 and 21 with the mean of 17.57 in the pantoprazole group and 16.80 in the ranitidine group; with the P-value of 0.006 there was a significant difference between them statistically (P < 0.05), however, clinically, there was no significant difference among these two groups (statistically but not clinically different). The minimum ICU stay was six and the maximum was 25 days, with an average of 14.06 in pantoprazole group and 11.6 in ranitidine group (with P-value of 0.001, they were significantly different). Among the total of patients, 15 patients died (15%), nine from pantoprazole (9% of all) and six from ranitidine the group (6% of all); with a mortality rate of 18.4% and 11.8% within the pantoprazole and ranitidine group, respectively. The difference was statistically significant (P < 0.001). With regard to multi-drug resistant pathogens, there were 38 (38%) resistant organisms totally, 27 within the pantoprazole group (55.1%) and 11 in the ranitidine group (21.6%). This means that multi-drug resistant (MDR) pathogens have grown significantly higher beside pantoprazole prophylaxis for SRMD (P = 0.001) (Table 2 and Figure 2). aValues are presented as No. (%) or Mean ± SD. Among all the patients, 14 cultures were positive for Acinetobacter (14%), 29 for Pseudomonas aeruginosa (29%), 13 for Staphylococcus aureus (13%), 23 for Proteus (23%) and 14 for Klebsiella pneumoniae (14%). Other organisms (i.e. coagulase negative staphylococci, E. coli, or Enterobacter) contributed to seven of the total cultures (7%). In details, within the pantoprazole group, 12 patients had their secretions positive for Acinetobacter (24.5%), 22 for Pseudomonas aeruginosa (44.9%), four for Staphylococcus aureus (8.2%), four for Proteus (8.2%), and six for Klebsiella pneumoniae (12.2%). One patient had a positive culture for other organisms as mentioned above (2.0%). 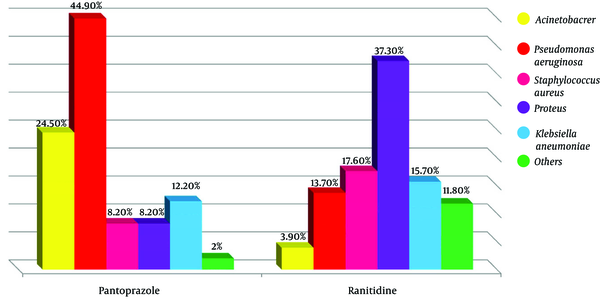 In the ranitidine group, the results included two Acinetobacter (3.9%), seven Pseudomonas aeruginosa (13.7%), nine Staphylococcus aureus (17.6%), 19 Proteus (37.3%), eight Klebsiella pneumoniae (15.7%), and six other organisms as defined above (11.8%). There was a significant difference between the types of organisms obtained from two groups. Some bacteria have grown more with pantoprazole and some with ranitidine. A total of 85.7% of patients with positive results for Acinetobacter and 75.9% for Pseudomonas aeruginosa had taken pantoprazole, while only 14.3% and 24.1% positive cultures for Acinetobacter and Pseudomonas aeruginosa had taken ranitidine, respectively. Therefore, there was a statistically significant between two groups (P < 0.001). In this study, there was also a significant difference between Staphylococcus aureus and Proteus organisms found in cultures of ranitidine and pantoprazole consumer (P < 0.001). This means that, 69.2% and 82.6% of positive cultures for Staphylococcus aureus and Proteus were related to ranitidine respectively, whereas 30.8% and 17.4% of positive cultures for Staphylococcus aureus and Proteus were related to pantoprazole consumers, respectively. Totally, the results between the two groups for each four pathogen were significantly different (P < 0.001) (Table 3). Multiple factors such as central nervous system diseases, level of consciousness and position of patients, along with ventilator circuit and increase in bacterial bioburden of the upper respiratory and orogastric tracts prepare the condition to establish nosocomial pneumonia. Among the factors that have an effect on the bacterial bioburden of the upper respiratory and orogastric tracts, the role of hospital stay duration, prolonged antibiotic exposures, and gastric acid suppression are prominent (4, 11-15). Interventions and strategies to eradicate oropharyngeal and/or intestinal microbial colonization, such as chlorhexidine oral care, prophylactic aerosolization of antimicrobials, selective decontamination of the digestive tract (SDD), use of sucralfate rather than H2 antagonists for stress ulcer prophylaxis, enteral feeding strategies that preserve gastric pH and also semirecumbent positioning, head elevation, or continuous subglottic suctioning have been frequently used to decrease the incidence of VAP (28-32). In contrast to a few studies that claimed that routine prophylaxis for stress-related bleeding, even in high-risk patients, seems to not be justified (18), several assessments in high-risk patients (ventilated for > 48 hrs. and coagulopathic) demonstrated that the risk of bleeding outweighs the risk of VAP from pH-modifying agents (29, 33, 34). There are various studies done to assess different gastrointestinal prophylactic agents in their ability to prevent gastrointestinal bleeding and their effect on establishing pneumonia in critically ill patients on mechanical ventilation. According to some of them, sucralfate versus other forms is accompanied by lower risk of pneumonia but may be the higher rates of bleeding (16, 35); one study with small sample size in children argues against this statement (36). A study that has been published by Huang et al., showed that H2-receptor antagonists resulted in no differential effectiveness in treating overt bleeding, however, it had higher rates of gastric colonization and ventilator-associated pneumonia (17). Another study by Kantorova et al. claimed that critically ill mechanical ventilated patients who have received ranitidine had a significantly lower rate of clinically important gastrointestinal bleeding than those treated with sucralfate (18). Although the analyses above, two studies have shown that prophylaxis with sucralfate or histamine-2 receptor antagonists is associated with minimal risk of VAP (37, 38). Two groups that examined the effect of PPIs on nosocomial pneumonia found no significant differences in pneumonia rates compared to histamine-2 receptor antagonists or sucralfate (18, 39). Solouki et al. conducted a study for comparing omeprazole and ranitidine as SRMD prophylaxis, in VAP incidence among ICU patients, and concluded that incidence of VAP did not differ significantly between them (22). There were few studies that have been done to evaluate pantoprazole (a now widely used SRMD prophylaxis agent for critically ill patients in ICU) and ranitidine (an H2-receptor blocker that is also widely used in these patients) with perspective of GI bleeding, hospital stay days, and VAP development. This issue was investigated by the authors of this article during the time. With this regard, in a study which has been done by Rahimi Bashar et al., the effect of ranitidine and pantoprazole on gastrointestinal bleeding prophylaxis in critically ill patients has been compared and showed that intermittent IV pantoprazole more effectively controls gastric pH and may prevent UGIB in them (23). In another study by Hajiesmaeili et al., it has been shown that despite a higher predicted mortality of critically ill patients in the pantoprazole recipients (about 8%), the ranitidine recipients had a higher mortality rate (13.9%) (24). Bashar et al. compared the effect of pantoprazole and ranitidine on VAP incidence has been compared, and the results showed significantly higher VAP occurrence in the pantoprazole group (25). Another study by Miano et al., yielded the same (26). As mentioned above, up to our knowledge, there is no study for evaluating different organisms obtained from sputum of the patients who had developed VAP, regarding to their gastrointestinal prophylaxis, and for studying whether there is a relationship between pathogens and SRMD prophylaxis agents or not. The difference observed in this study might be due to an inflammatory response arisen by each agent. Concerning this theory, in a study that has been done by Sasaki and colleagues, lanaprazole has been shown as an inhibitor of rhinovirus replication in tracheal epithelial cells, with reducing cytokine production and decrease in ICAM-1 (intercellular adhesion molecule-1) production (40). Also in some studies it has been showed that PPIs have anti-inflammatory effect by means of neutrophil adhesion to endothelial cells (41). Tabeefar et al. suggested that pantoprazole may have anti-inflammatory effects on critically ill patients (42). In spite of these inflammation regulatory effects of pantoprazole, the more growth of some organisms may be due to constant lower pH, which has been made by pantoprazole and results in bacterial overgrowth and consequent bacterial translocation (43). Regarding previous studies by authors of this investigation and other researchers, it can be suggested that each bacterium has a unique ability and propensity to grow in specific gastric pH or other systemic changes made by various agents used for SRMD prophylaxis; consequently different prognosis and outcome can be expected by using each agent. Due to lacking sufficient data for confirming this theory, more studies should be done for evaluating patients with ventilator associated pneumonia based on the responsible organisms and regarding to gastrointestinal prophylaxis they were on. As mentioned before, according to the results of this study, suggesting the fact that different bacteria have various propensities to grow in specific gastric pH or other systemic changes made by different gastric acid suppressors seems justified; however, due to the small sample size, which confines clinical judgment and external validity, more studies, especially clinical trials, should be done to evaluate more critically ill patients receiving SRMD prophylaxis, with perspective of VAP incidence, the responsible organisms, hospital and ICU stay days, and mortality rate in order to prevent horrid outcomes caused by specific organisms. The authors would like to thank Ms. Hosna Forooghirad for her companionship during the study design and data gathering, Dr. Adineh Taherkhani for her beneficial comments during revisions, and also the staff of the ICU and Laboratory Department of Besat Hospital, Hamadan, Iran, for their kind help in collecting and testing the clinical samples. Authors' Contribution: Study concept and design: Farshid Rahimi Bashar, Mohammadreza Hajiesmaeili. Acquisition of data: Farshid Rahimi Bashar, Saadat Torabian. Data analysis: Mohammadreza Hajiesmaeili, Arezoo Chouhdari, Zahra Doosti. Drafting of the manuscript: Zahra Doosti. Editing and revision: Mohammadreza Hajiesmaeili, Zahra Doosti, Arezoo Chouhdari, Shervin Shokouhi, Zahra Sahraei, Seyed Pouzhia Shojaei, Mohammad Fathi and.Reza Goharani. Ethical Considerations: Proposal submission number by Hamadan University of Medical Sciences: D/B/16/35/1009. Funding/Support: There was no financial support and funding. 1. Safdar N, Dezfulian C, Collard HR, Saint S. Clinical and economic consequences of ventilator-associated pneumonia: A systematic review. Crit Care Med. 2005;33(10):2184-93. [PubMed: 16215368]. 2. Melsen WG, Rovers MM, Bonten MJM. Ventilator-associated pneumonia and mortality: A systematic review of observational studies. Crit Care Med. 2009;37(10):2709-18. doi: 10.1097/CCM.0b013e3181ab8655. 3. Warren DK, Shukla SJ, Olsen MA, Kollef MH, Hollenbeak CS, Cox MJ, et al. Outcome and attributable cost of ventilator-associated pneumonia among intensive care unit patients in a suburban medical center. Crit Care Med. 2003;31(5):1312-7. doi: 10.1097/01.CCM.0000063087.93157.06. [PubMed: 12771596]. 4. Herzig SJ, Howell MD, Ngo LH, Marcantonio ER. Acid-suppressive medication use and the risk for hospital-acquired pneumonia. JAMA. 2009;301(20):2120-8. doi: 10.1001/jama.2009.722. [PubMed: 19470989]. 5. Nguile-Makao M, Zahar JR, Francais A, Tabah A, Garrouste-Orgeas M, Allaouchiche B, et al. Attributable mortality of ventilator-associated pneumonia: Respective impact of main characteristics at ICU admission and VAP onset using conditional logistic regression and multi-state models. Intensive Care Med. 2010;36(5):781-9. doi: 10.1007/s00134-010-1824-6. [PubMed: 20232046]. 6. Wolkewitz M, Beyersmann J, Gastmeier P, Schumacher M. Modeling the effect of time-dependent exposure on intensive care unit mortality. Intensive Care Med. 2009;35(5):826-32. doi: 10.1007/s00134-009-1423-6. [PubMed: 19183943]. 7. Horan TC, Andrus M, Dudeck MA. CDC/NHSN surveillance definition of health care-associated infection and criteria for specific types of infections in the acute care setting. Am J Infect Control. 2008;36(5):309-32. doi: 10.1016/j.ajic.2008.03.002. [PubMed: 18538699]. 8. Klompas M. Interobserver variability in ventilator-associated pneumonia surveillance. Am J Infect Control. 2010;38(3):237-9. doi: 10.1016/j.ajic.2009.10.003. [PubMed: 20171757]. 9. Schreiber MP, Chan CM, Shorr AF. Resistant pathogens in nonnosocomial pneumonia and respiratory failure: Is it time to refine the definition of health-care-associated pneumonia? Chest. 2010;137(6):1283-8. doi: 10.1378/chest.09-2434. [PubMed: 20154075]. 10. Giannella M, Pinilla B, Capdevila JA, Martinez Alarcon J, Munoz P, Lopez Alvarez J, et al. Pneumonia treated in the internal medicine department: Focus on healthcare-associated pneumonia. Clin Microbiol Infect. 2012;18(8):786-94. doi: 10.1111/j.1469-0691.2011.03757.x. [PubMed: 22284436]. 11. Metheny NA, Clouse RE, Chang YH, Stewart BJ, Oliver DA, Kollef MH. Tracheobronchial aspiration of gastric contents in critically ill tube-fed patients: Frequency, outcomes, and risk factors. Crit Care Med. 2006;34(4):1007-15. doi: 10.1097/01.CCM.0000206106.65220.59. [PubMed: 16484901]. [PubMed Central: PMC2396145]. 12. Bercault N, Boulain T. Mortality rate attributable to ventilator-associated nosocomial pneumonia in an adult intensive care unit: A prospective case-control study. Crit Care Med. 2001;29(12):2303-9. [PubMed: 11801831]. 13. Bornstain C, Azoulay E, De Lassence A, Cohen Y, Costa MA, Mourvillier B, et al. Sedation, sucralfate, and antibiotic use are potential means for protection against early-onset ventilator-associated pneumonia. Clin Infect Dis. 2004;38(10):1401-8. doi: 10.1086/386321. [PubMed: 15156478]. 14. Vincent JL. Nosocomial infections in adult intensive-care units. The Lancet. 2003;361(9374):2068-77. doi: 10.1016/s0140-6736(03)13644-6. 15. Hamishekar H, Shadvar K, Taghizadeh M, Golzari SE, Mojtahedzadeh M, Soleimanpour H, et al. Ventilator-associated pneumonia in patients admitted to intensive care units, using open or closed endotracheal suctioning. Anesth Pain Med. 2014;4(5). e21649. doi: 10.5812/aapm.21649. [PubMed: 25729677]. [PubMed Central: PMC4333305]. 16. Darlong V, Jayalakhsmi TS, Kaul HL, Tandon R. Stress ulcer prophylaxis in patients on ventilator. Trop Gastroenterol. 2003;24(3):124-8. [PubMed: 14978984]. 17. Huang J, Cao Y, Liao C, Wu L, Gao F. Effect of histamine-2-receptor antagonists versus sucralfate on stress ulcer prophylaxis in mechanically ventilated patients: A meta-analysis of 10 randomized controlled trials. Crit Care. 2010;14(5):R194. doi: 10.1186/cc9312. [PubMed: 21034484]. [PubMed Central: PMC3219301]. 18. Kantorova I, Svoboda P, Scheer P, Doubek J, Rehorkova D, Bosakova H, et al. Stress ulcer prophylaxis in critically ill patients: A randomized controlled trial. Hepatogastroenterology. 2004;51(57):757-61. [PubMed: 15143910]. 19. Conrad SA, Gabrielli A, Margolis B, Quartin A, Hata JS, Frank WO, et al. Randomized, double-blind comparison of immediate-release omeprazole oral suspension versus intravenous cimetidine for the prevention of upper gastrointestinal bleeding in critically ill patients. Crit Care Med. 2005;33(4):760-5. [PubMed: 15818102]. 20. American Thoracic Society; Infectious Diseases Society of America. Guidelines for the management of adults with hospital-acquired, ventilator-associated, and healthcare-associated pneumonia. Am J Respir Crit Care Med. 2005;171(4):388-416. doi: 10.1164/rccm.200405-644ST. [PubMed: 15699079]. 21. Williams C, McColl KE. Review article: proton pump inhibitors and bacterial overgrowth. Aliment Pharmacol Ther. 2006;23(1):3-10. doi: 10.1111/j.1365-2036.2006.02707.x. [PubMed: 16393275]. 22. Solouki M, Marashian SM, Kouchak M, Nasiri AA, Mokhtari M, Amirpour A. Ventilator-associated pneumonia among ICU patients receiving mechanical ventilation and prophylaxis of gastrointestinal bleeding. Iranian J Clin Infect Dis. 2009;4(3):177-80. 23. Rahimi Bashar F, Rastgouyhaghi AR, Torabian S, Hajiesmaeili MR, Sedaghat AR, Seifi S, et al. Prevention of Stress Related Mucosal Disease with Intermittent Intravenous Pantoprazole and Ranitidine in Critically Ill Patients. J Pharm Care. 2013;1(3):81-4. 24. Hajiesmaeili MR, Moradi Moghadam O, Sedaghat A, Niakan M, Seifi S, Bashar FR, et al. Evaluation of ventilator-associated pneumonia according to stress related mucosal disease prophylaxis regimen in the intensive care unit. Arch Anesthesiol Critical Care. 2015;1(4):116-9. 25. Bashar FR, Manuchehrian N, Mahmoudabadi M, Hajiesmaeili MR, Torabian S. Effects of ranitidine and pantoprazole on ventilator-associated pneumonia: A randomized double-blind clinical trial. Tanaffos. 2013;12(2):16-21. [PubMed: 25191457]. [PubMed Central: PMC4153243]. 26. Miano TA, Reichert MG, Houle TT, MacGregor DA, Kincaid EH, Bowton DL. Nosocomial pneumonia risk and stress ulcer prophylaxis: A comparison of pantoprazole vs ranitidine in cardiothoracic surgery patients. Chest. 2009;136(2):440-7. doi: 10.1378/chest.08-1634. [PubMed: 19318661]. 27. Schurink CAM, Nieuwenhoven CAV, Jacobs JA, Rozenberg-Arska M, Joore HCA, Buskens E, et al. Clinical pulmonary infection score for ventilator-associated pneumonia: Accuracy and inter-observer variability. Intensive Care Med. 2004;30(2):217-24. doi: 10.1007/s00134-003-2018-2. [PubMed: 14566455]. 28. Husebye E. The pathogenesis of gastrointestinal bacterial overgrowth. Chemotherapy. 2005;51 Suppl 1:1-22. doi: 10.1159/000081988. [PubMed: 15855746]. 29. Dodek P, Keenan S, Cook D, Heyland D, Jacka M, Hand L, et al. Evidence-based clinical practice guideline for the prevention of ventilator-associated pneumonia. Ann Intern Med. 2004;141(4):305-13. [PubMed: 15313747]. 30. Bergmans DC, Bonten MJ, Gaillard CA, Paling JC, van der Geest S, van Tiel FH, et al. Prevention of ventilator-associated pneumonia by oral decontamination: A prospective, randomized, double-blind, placebo-controlled study. Am J Respir Crit Care Med. 2001;164(3):382-8. doi: 10.1164/ajrccm.164.3.2005003. [PubMed: 11500337]. 31. Tlaskalova-Hogenova H, Stepankova R, Hudcovic T, Tuckova L, Cukrowska B, Lodinova-Zadnikova R, et al. Commensal bacteria (normal microflora), mucosal immunity and chronic inflammatory and autoimmune diseases. Immunol Lett. 2004;93(2-3):97-108. doi: 10.1016/j.imlet.2004.02.005. [PubMed: 15158604]. 32. Grap MJ, Munro CL, Unoki T, Hamilton VA, Ward KR. Ventilator-associated pneumonia: The potential critical role of emergency medicine in prevention. J Emerg Med. 2012;42(3):353-62. doi: 10.1016/j.jemermed.2010.05.042. [PubMed: 20692786]. 33. Faisy C, Guerot E, Diehl JL, Iftimovici E, Fagon JY. Clinically significant gastrointestinal bleeding in critically ill patients with and without stress-ulcer prophylaxis. Intensive Care Med. 2003;29(8):1306-13. doi: 10.1007/s00134-003-1863-3. [PubMed: 12830375]. 34. Hsu TC, Su CF, Leu SC, Huang PC, Wang TE, Chu CH. Omeprazole is more effective than a histamine H2-receptor blocker for maintaining a persistent elevation of gastric PH after colon resection for cancer. Am J Surg. 2004;187(1):20-3. [PubMed: 14706580]. 35. Prakash S, Rai A, Gogia AR, Prakash S. Nosocomial pneumonia in mechanically ventilated patients receiving ranitidine or sucralfate as stress ulcer prophylaxis. Indian J Anaesth. 2008;52(2):179-84. 36. Lopriore E, Markhorst DG, Gemke RJ. Ventilator-associated pneumonia and upper airway colonisation with gram negative bacilli: The role of stress ulcer prophylaxis in children. Intensive Care Med. 2002;28(6):763-7. doi: 10.1007/s00134-002-1289-3. [PubMed: 12107684]. 37. Collard HR, Saint S, Matthay MA. Prevention of ventilator-associated pneumonia: An evidence-based systematic review. Ann Intern Med. 2003;138(6):494-501. 38. Kallet RH, Quinn TE. The gastrointestinal tract and ventilator-associated pneumonia. Respir Care. 2005;50(7):910-21. discussion 921-3. [PubMed: 15972112]. 39. Mallow S, Rebuck JA, Osler T, Ahern J, Healey MA, Rogers FB. Do proton pump inhibitors increase the incidence of nosocomial pneumonia and related infectious complications when compared with histamine-2 receptor antagonists in critically ill trauma patients? Curr Surg. 2004;61(5):452-8. doi: 10.1016/j.cursur.2004.03.014. [PubMed: 15475094]. 40. Sasaki T, Yamaya M, Yasuda H, Inoue D, Yamada M, Kubo H, et al. The proton pump inhibitor lansoprazole inhibits rhinovirus infection in cultured human tracheal epithelial cells. Eur J Pharmacol. 2005;509(2-3):201-10. doi: 10.1016/j.ejphar.2004.12.042. [PubMed: 15733557]. 41. Ichikawa H, Yoshida N, Takagi T, Tomatsuri N, Katada K, Isozaki Y, et al. Lansoprazole ameliorates intestinal mucosal damage induced by ischemia-reperfusion in rats. World J Gastroenterol. 2004;10(19):2814-7. [PubMed: 15334676]. [PubMed Central: PMC4572108]. 42. Tabeefar H, Beigmohammadi MT, Javadi MR, Abdollahi M, Mahmoodpoor A, Ahmadi A, et al. Effects of pantoprazole on systemic and gastric pro- and anti-inflammatory cytokines in critically ill patients. Iran J Pharm Res. 2012;11(4):1051-8. [PubMed: 24250536]. [PubMed Central: PMC3813167]. 43. Alroumi F, Sarwar A, Grgurich PE, Lei Y, Hudcova J, Craven DE. Strategies for prevention of ventilator-associated pneumonia: Bundles, devices, and medications for improved patient outcomes. Hosp Pract (1995). 2012;40(1):81-92. doi: 10.3810/hp.2012.02.949. [PubMed: 22406884].